KM#119 Fils. Year: 1959 - AH 1379. Weight: 2.50g. Metal: Bronze. Diameter: Scalloped, 19 mm. Edge: Plain. Alignment: Medal. Mint: British Royal Mint. 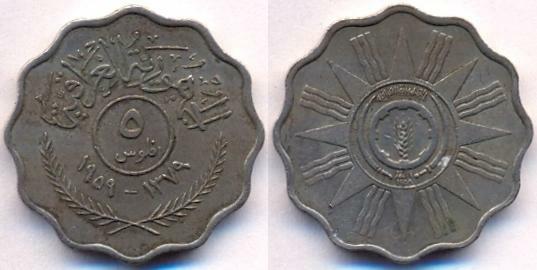 Obverse: "al Jumhuriyah al-Iraqiyah" (Republic of Iraq) written above. Value in center circle. CE year and AH year below circle and above sprigs. Reverse: 1st Anniversary of the Republic. Mintage: 72,000,000 + 400 Proofs. Minted Years: one year type. KM#120 5 Fils. Year: 1959 - AH 1379. Weight: 5.00g. Metal: Copper-Nickel. Diameter: Scalloped, 22 mm. Edge: Plain. Alignment: Medal. Mint: British Royal Mint. 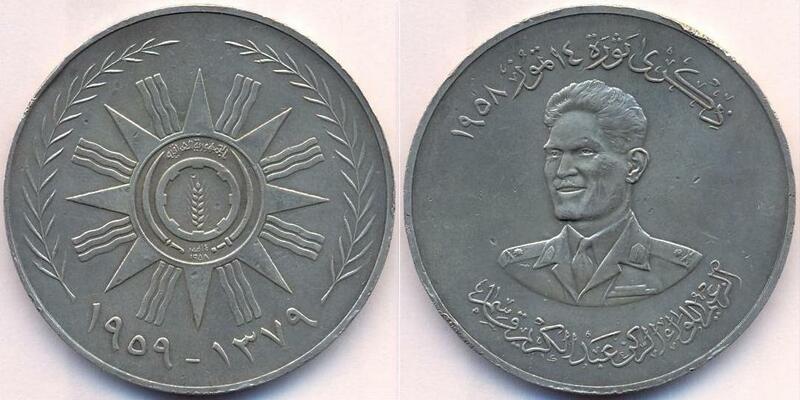 Obverse: "al Jumhuriyah al-Iraqiyah" (Republic of Iraq) written above. Value in center circle. CE year and AH year below circle and above sprigs. Reverse: 1st Anniversary of the Republic. Mintage: 30,000,000 + 400 Proofs. Minted Years: one year type. KM#121 10 Fils. Year: 1959 - AH 1379. Weight: 6.75g. Metal: Copper-Nickel. Diameter: Scalloped, 26 mm. Edge: Plain. Alignment: Medal. Mint: British Royal Mint. 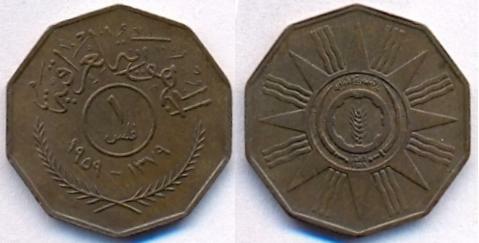 Obverse: "al Jumhuriyah al-Iraqiyah" (Republic of Iraq) written above. Value in center circle. CE year and AH year below circle and above sprigs. Reverse: 1st Anniversary of the Republic. Mintage: 24,000,000 + 400 Proofs. Minted Years: one year type. KM#122 25 Fils. Year: 1959 - AH 1379. Weight: 2.50g. Metal: 0.500 Silver. Diameter: 20 mm. Edge: Reeded. Alignment: Medal. Mint: British Royal Mint. 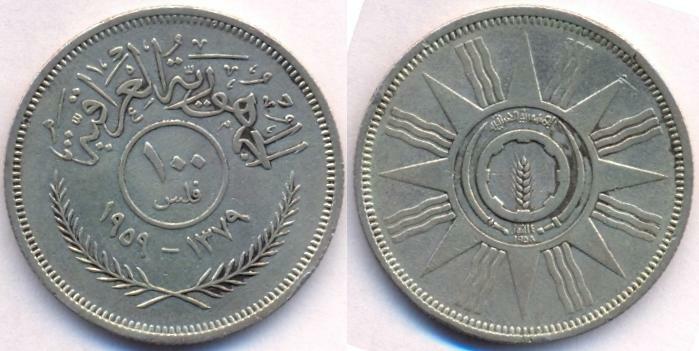 Obverse: "al Jumhuriyah al-Iraqiyah" (Republic of Iraq) written above. Value in center circle. CE year and AH year below circle and above sprigs. Reverse: 1st Anniversary of the Republic. Mintage: 12,000,000 + 400 Proofs. Minted Years: one year type. KM#123 50 Fils. Year: 1959 - AH 1378. Weight: 5.00g. Metal: 0.500 Silver. Diameter: 23 mm. Edge: Reeded. Alignment: Medal. Mint: British Royal Mint. 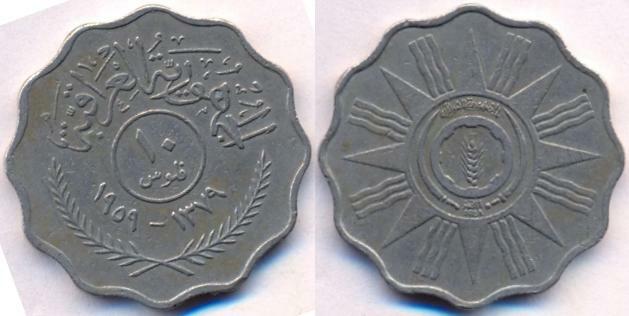 Obverse: "al Jumhuriyah al-Iraqiyah" (Republic of Iraq) written above. Value in center circle. CE year and AH year below circle and above sprigs. Reverse: 1st Anniversary of the Republic. Mintage: 24,000,000 + 400 Proofs. Minted Years: one year type. This is the only coin in this series which has year AH 1378. KM#124 100 Fils. Year: 1959 - AH 1379. Weight: 10.00g. Metal: 0.500 Silver. Diameter: 23 mm. Edge: Reeded. Alignment: Medal. Mint: British Royal Mint. 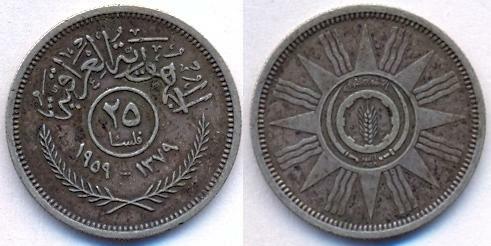 Obverse: "al Jumhuriyah al-Iraqiyah" (Republic of Iraq) written above. Value in center circle. CE year and AH year below circle and above sprigs. Reverse: 1st Anniversary of the Republic. Mintage: 6,000,000 + 400 Proofs. Minted Years: one year type. M#1 or Dav#510 Medallic Issue. Year: 1959 - AH 1379. Weight: 37.50g. Metal: 0.500 Silver. Diameter: 45 mm. Edge: Lettered. 14 July 1958 engraved three times between two stars. Alignment: Medal. Mint: British Royal Mint. Obverse: 1st Anniversary of the Republic. Reverse: General Abdul Karim Kassem portrait titled left. Date of military coup "14th July 1958" written above. Mintage: 500,000. Minted Years: one year type. Note: General Abdul Karim Kassem was involved in military coup with Muhammad Najib al-Rubai. Abdul Karim was Prime Minister under Muhammad Najib's Presidential rule. An irresistible note: Krause-Mishler book mentions this coin as 50 Dinars, but theoretical based on the above two silver coins it should be just 375 fils. An admirer of my website, Charles R. Carlson from Staten Island, New York commented on this coin: "At the time of its issue, it was called, in this country a 500 fils coin or medal. The Iraqi 50 Dinars till 1971 worth 50x2.8 = $140. This coin does not justify that much worth by its silver fineness and weight". Later probably in 2009 onwards, Krause publication realized their mistake and corrected it as 500 fils coin. 750 - 1258: Abbasid Dynasty. 1358 - 1432: Jalayirid Dynasty. 1638 - 1917: Ottoman Empire.